Please see the '2017 Membership' link on the LH side of the web page for the link to the 2017 Membership form. The signing on will take place upstairs in The British on North Quay in Douglas and complimentary chip butties will be provided. The popular turbo training sessions have now finished for the Christmas and New Year festivities. The sessions resume on Wednesday January 4 at the Resource Centre, Glen Crutchery Road opposite the TT Grandstand. We will be holding our annual Christmas Lunch at the Talk of the Town, Nobles Park on Sunday 11th December 2016 12.45 for 1.15pm serving of the carvery. We have the full restaurant booked for our club afternoon and it would be great to see old and new members and friends at the lunch. The numbers are limited to 65 which is less than previous years so please get your name down early to reserve you place, we will require full payment of your meals by Saturday 3rd December at latest or your place cannot be guaranteed. The cost of the lunch for members is £15 and non members £20, the club will also subsidise children under 12 price will be £8.00. Order Form and choice of meals can be found here. PLEASE ADVISE IF YOU WISH TO BE SEATED IN ANY PARTICULAR GROUP. Payments for the lunch will need to be sent to arrive no later than 3rd December to Nigel Clucas, 28 Banks Howe, Onchan. IM3 2ES. NB - Cheques post dated beyond 3 December 2016 will not be accepted as the restaurant will not issue any refunds for non-attendance. We are pleased to inform everyone that Team Manx Telecom will be running the popular Turbo sessions again this winter. We have secured the Resource Centre off Glencrutchery Road. This excellent facility is located behing the St Johns Ambulance centre and there is ample parking plus easy access. The sessions will be run by Peter Kennaugh Snr and Brian Draper who are both qualified coaches. The sessions will commence on Wednesday 16th November - doors open at 6.30pm for a 7pm prompt start. All you require is your bike, turbo trainer, a couple of drink bottles and your cycling shoes of course! This year’s ride will again be focused on the north of the Island with a café stop in the stunning surroundings of the Milntown Estate. We have written a few words about the funds you have helped raise to date. ‘Since the James Berry Fund started in 2007 you have raised over £17,000 to help local young cyclists experience racing across the UK and Europe. Riders that you have helped to gain experience across the UK and Europe include Tom Black, Colum O’Shea, Chris Nicholson, Tim Kennaugh, Chris Whorrall, Jonny Bellis, Jake Kelly, Tom Mazzone, Sophie Black, Leon Mazzone, Owen Dudley and Matthew Drapper. As usual there will be two routes this year. The longer route will leave from the Grandstand at 9:00am and be approx 55 mile route. The shorter route will leave the Mooragh Park at 9.30am and follow an approx 20 mile route to the café. Sign on sheets will be in Bikestyle from Wednesday 4th October and the cost of the ride is £10. This will give you a ticket to cover refreshments at the café with the remainder of the funds raised going to the James Berry Fund. We hope to see as many of you out as possible on the day. Let’s hope we get the great weather we have been blessed with every other year to help facilitate a great ride. No more than 3 items can be ordered at the subsidised member price. Any additional items will be charged at full price. This is to avoid exceeding the subsidy budget. Orders will only be accepted via post, there is no online ordering this year in view of the deposit required. You will need to enclose payment for a 50% deposit...this is being done as a few members found it difficult to pay the full amount just before Christmas last year i.e. money already spent on pressies and parties (or new bike orders)! Orders will be accepted up to 16th October 2016 to allow time for order collation before submitting to our supplier. We need to have the supplier invoice paid before the end of 2016 in order to qualify for the subsidy from Manx Telecom. The order form can be found in the '2016 CLUB CLOTHING' section on the LH side of this page. Please print it off, fill out the details and post to Mel Draper with your deposit. Cheques should be made payable to 'Manx Road Club' please. What's the next best thing to winning in Rio? Getting on the podium in the Fred Kelly that is what! 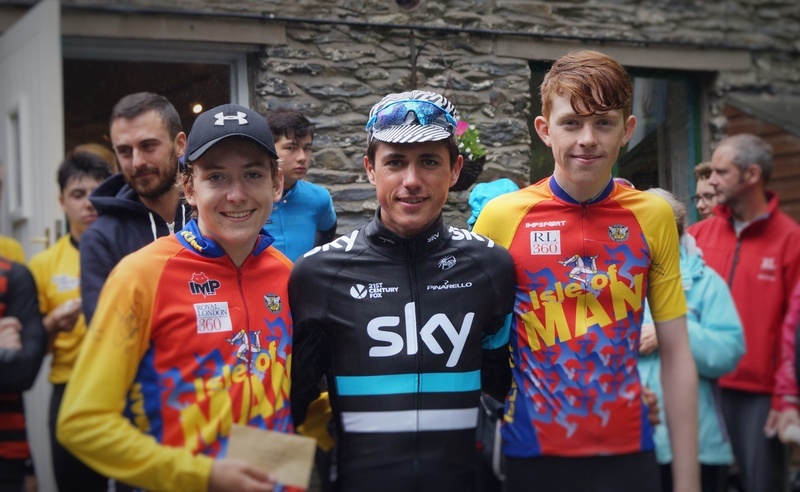 Seems that no matter how hard it tried to dampen the spirits of the competitors in the Fred Kelly Memorial road race this morning, the weather could not stop these three grinning from ear-to-ear after conquering the lung bursting climb out of Tholt-y-Will. Batman and Si led the race from the 1st lap right up to the bottom of the climb and a comment something along the lines of 'felt like I was going backwards' came as a result of the attacks from Pete, William and Thomas. In the end it was watts per kilo that determined the outcome and initial rumour of large crowds on the climb that might cause Mr Kelly to stall the lead car and cause a pile-up, were totally unfounded. A big thank you to all the competitors for taking part and also to Jim, the drivers, marshalls, ambulance crew and all helpers for enabling this event to be run. Also, a big thank you to the Tea Barn for some fine post event refreshments and cake. Please see the results from the Manx Telecom sponsored, Manx Road Club organised Nelson Trophy Memorial Mountain Time Trial here. For future running of this event can competitors please ensure that they are aware of the correct course to be followed at Governor's Bridge i.e. turn right before reaching the roundabout and head down the dip that the motorcycles in the TT use. It is NOT acceptable to use the roundabout in the normal manner or cut across the road to the right of the roundabout. There were a number of near-misses due to competitors taking the wrong route as the police will only stop traffic for those on the correct course. Failure to complete the correct route could in future result in disqualification. 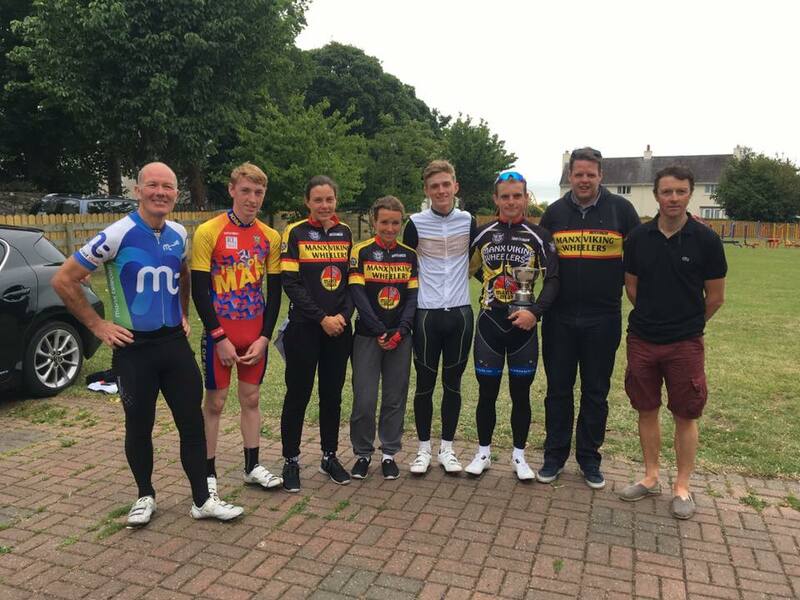 There was a good turnout for today’s Manx Viking Wheelers hosted time trial championships. 37 riders contested the event in breezy conditions with the top 3 positions going to Manx Viking Wheelers riders. Champion for 2016, and recipient of the Penrice trophy, with a time of 54.54 was Robin Garry, 2nd was the ever improving Andrew Jones with a time of 56.28, and in 3rd place was junior rider Owen Dudley with a time of 56.57. Category winners were RL360’s Harry Cain (Youth) 59.51, MVW’s Owen Dudley (Junior) 56.57, MVW’s Kathryn Priest (Senior Lady) 1.03.42, MVW’s Robin Garry (Senior Male) 54.54, MVW’s Sally Walker (Veteran Lady) 1.07.36, MMBC’s Mark Harrison (Veteran U50) 57.30, TMT’s Peter Gage (Veteran Over 50) 58.52. A big thank you to all who came forward to help marshal and make the event a success. Fred Kelly Memorial Road Race Sunday 24th July - this is one of main road races of the season with the challenging finish on Tholt-Y-Will, we will be running an A & B Race. Entries for this event should be open on TLI website but if any issues send direct to Jim with entry form and fee - Jim Cottier, 116 Ballanorris Cresccent, Ballabeg IM9 4EU. Club kit is a requirement for local Road Road Races and it would be nice to see a good few Manx Telecom shirts in the race. Again we need marshals for this event and any offers would be greatly received. Refreshments (vouchers supplied) will be provided for riders and helpers at the Tea Barn and the bottom of Tholt-Y-Will after the race. The next event to be run by the Club is "The Nelson Memorial Mountain Time Trial" run in conjunction with the Shoprite Challenge on Sunday 17th July 2016. Entries are now open for this event, this is the only chance this year to ride a lap of the TT course with the Traffic lights switched off and Police marshalling key junctions. All riders entering the time trial must be a member of the TLI and have a working rear light. The entries can be done on the TLI website or if issues with website, sent direct with an entry form to Jim Cottier, 116 Ballanorris Cresccent, Ballabeg IM9 4EU. If you are not riding but prepared to help we need marshals to cover the area from Creg na Baa to Governors Bridge, Shoprite provide marshals and police for the rest of the course. Please let Jim know if you can marshal via [email protected] or mobile 495436. Manx Viking Wheelers will this Sunday 26 June be hosting the Penrice 25 Mile Time Trial Championships over the usual 25 mile course. Sign on is from 8 a.m. at Ballaugh Parish Hall with the first rider away at 9.01 from Rhencullen. Could all competitors please park on the grass beside the Church Hall as there were various complaints after the Rob Rohrer from local residents. Also could riders refrain from warming up on their rollers on the pavements as again there were several complaints about pavements being blocked. Please note a rear light is required on your bike. 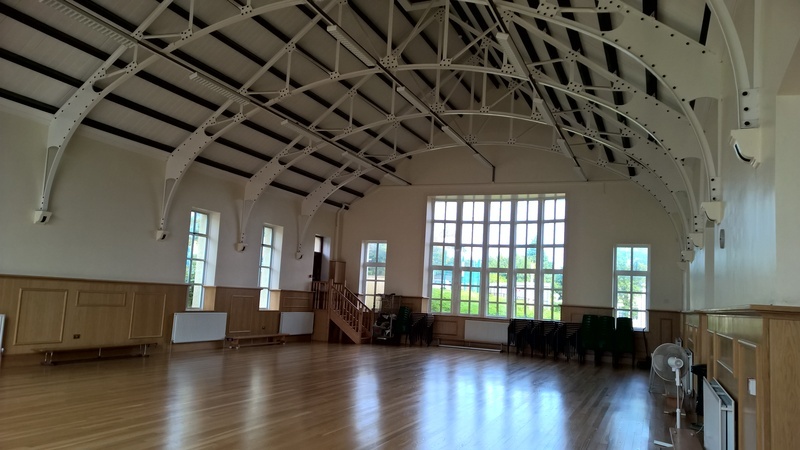 Refreshments will be served in the Church Hall after the event. Due to the Ellan Vannin C.C. having to cancel the Nick Corkill Road Race Champs today due to roadworks I had been asked by their Chairman, Richard Fletcher, that as The Manx Road Club are the only other club to hold a race in May, which is traditionally the month to hold any National R.R. Champs if we would be prepared to incorporate the Champs into The John Hamer Road Race on the 22nd of May. This club is only too happy to help out with this request. More information about this race can be found on the TLI Cycling Website calender. Postal entries will be accepted up until the closing date. I'm sorry to say that the above event has been cancelled as a result of major road works on the Andreas to Ramsey road that are due to continue until August at least. Something we only became aware of over the weekend. I am working on an alternative but, in any case, it will not happen on 8 May. I will keep you informed either directly or in the press. Once again the Gods smiled upon us and we had some fantastic weather, albeit a little chilly for the ex-Majorca contingent, for the event this morning. Great to see new PB's from some AFG members (all that winter training has been paying off) and also a few newbie 25 Mile TT participants too. Rumour has it that a new award is in the pipeline for a rider exposing the most skin in temperatures below 8 degrees Celsius and there was at least one potential candidate for that this morning. It has also been confirmed this afternoon that shares at Riley's have taken a slight dip in the last few weeks due to a major drop in orders for the Althlete's breakfasts due to the recent good weather. Perhaps after all, that additional protein has helped with building some extra power...who knows! Finally, a big congratulations to the major prize winners and well done to all competitors for supporting the event this morning and providing an excellent example of safe riding. Hope you all continue to enjoy your riding and fingers crossed for a continuation of the favourable weather for future events.